Financing and Innovation: Interested in investing in new food businesses? Want to pitch your idea to investors? Join us at the Financing & Innovation Conference and help food and farm businesses gain access to capital. Trade Show & Policy: Farmers, producers, buyers, schools and industry stakeholders meet to share knowledge and discuss policy developments. The Good Food Trade Show has featured more than 100 sustainable food exhibitors! 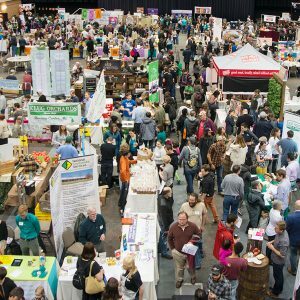 Good Food EXPO: Join us for a day celebrating Good Food! Discover new artisanal goods from over 150 exhibitors, learn from workshops and chefs demos, and explore our family-friendly programming!